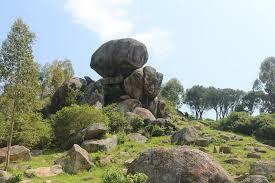 Karegyeya rock is found just 3 kilometers (1 mile) outside Ntungamo Town within Karegyeya Village, Kinoni Parish and Ntungamo sub-county on the road leading Rukungiri. The myth of this fascinating Rock surrounds some local traditional of the Ancient Bachwezi, believed to be demigods who took human appearance yet never died. It is believed that the Bachwezi would only disappear in to the Underworld instead of dying like other normal humans. It is also said that these people were the original traditional rulers of Bunyoro Empire, apparently legendary Kingdom that existed in the 14th and 15th Centuries and extended through the parts of present day Uganda (of course including Ntungamo), Rwanda, Democratic Republic of Congo, Burundi, Kenya and Tanzania. The Bachwezi were also said to be related to the Batembuzi, a dynasty founded by Ruhanga, locally translated as “the Creator”. The last ruler of the Batembuzi dynasty known as Isaza is said in tradition to have married and sired a child with Nyamata, the daughter of King of the Underworld known as Nyamiyonga. Because of this, King Nyamiyonga later sought vengeance against King Isaza for attempting to lie and lure him into the Underwood from where he was never to return to the World of normal men. This Historical Rock is said to form an entrance to the Underworld that the Bachwezi are believed to reside from. A legend is said that the fires seen at night emanate from the Karegyeya Rocks with ashes are Worldly items scattered around them at day break. In order to keep the locals away and prevent them from discovering the secrets of the Karegyeya Rocks and a further myth of a huge snake that wanders under the Rock also exists. This snake is so large and it is said that its stomach contains a Lake, large enough that when the Rock ever got destroyed, the waters from the mysterious Lake would also break free and destroy the surrounding area like you see a Dam breaking. It is also said that inside the Rock is where the people would find food and money in the morning when no one knew who owned it.